Has it been awhile since you’ve been to the gym? Perhaps you’re a new member. Or maybe you’re a long-time member who has a million and one reasons why the gym hasn’t been priority for you. It’s OK! We’ve all been there at some point – stuck in a rut of not going to the gym, possibly falling out of shape and losing sight of how to best take care of yourself through physical exercise. Now that it’s all in the past and you want to get back into the swing of things, it’s important to set yourself up for success. First think about the “why” – why you’re committing yourself to going to the gym. 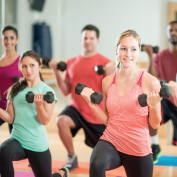 Take some time and really think about your own personal “why.” An obvious “why” is for your own personal health, benefiting from the gym’s offering of personal training sessions, free weights and exercise machines, treadmills and indoor cycling, group fitness classes, and more. Dig a little deeper and think about a “why” that is close to you, the center of your reason to get back into the gym. Write it down and hold on to it – this “why” will help keep you motivated throughout your fitness journey. Next, set realistic goals for yourself. Are you a non-runner who wants to train and complete a competitive race? Try a 10K first to set the pace. Then if you’re feeling ready, go after a half marathon. Are you an active person but haven’t been consistent with gym attendance? Try going once or twice per week maximum in the beginning, and increasing one additional day per week once you’ve found, and feel comfortable in, your new routine. Which brings us to: find a routine that you can be passionate about and that makes you feel amazing/healthy/empowered/inspired/on-top-of-the-world inside of your fitness self. Think about what you enjoy doing, and what you do not enjoy doing. You’re more likely to be excited by, and stick to, a fitness plan that incorporates things that you are passionate about and have fun doing. If you’re not sure, that’s OK too. Try out any and everything to see what fits you: from running to yoga to dance classes to weight lifting to personal training, and more. Lastly, commit yourself to a schedule and time frame that is within reason for you and your lifestyle. Sometimes thinking too far in advance overwhelms and paralyzes you with fear, indecision and uncertainty. Maybe start with going to one group fitness class plus one day of running per week, for 30 days. After those 30 days, re-evaluate and readjust your schedule based on how you feel and your fitness goals. Breaking up into incremental time frames like 30 days can help make a big goal seem more manageable. You CAN do this! You’re already committed to going back to the gym, now use these tips to help you stay committed throughout your fitness journey to a healthier, happier you.